When something goes wrong with your bathroom plumbing in Fairport, NY, it is, at the very least, annoying. Sometimes, bathroom plumbing problems can even be dangerous. That’s why we are here for you. At GT Campbell, we know that you can’t always handle plumbing issues on your own. Call our expert plumbers to come out and look at things today. We’ll let you know what we find and get it fixed fast. When you call GT Campbell, you’re calling plumbers who know that their job goes beyond making your home run well. When things work at home, your life works. When they don’t work at home, life can be hard. We want to help you live better, so we will work quickly and carefully to get your home back the way you need it. We’ll fix anything that goes wrong with your plumbing, but we see certain issues quite a bit. Here are a few of the things we see most often when we are working on bathroom plumbing in Fairport, NY. Sink problems. Sinks can get clogged and back up, leak underneath, stop running hot or cold water or both, leak out of the faucet, and more. When you have a problem with your sink, call us fast. We’ll make sure everything works again soon. Toilet problems. Toilets can back up, overflow, leak out of the bottom, stop flushing, run all the time, flush slowly, make you jiggle the handle to stop the water, and more. All of these issues are straightforward fixes for your plumber, so call as soon as you notice a problem. Tub and shower problems. Tubs and showers can stop draining, drain slowly, leak around the seal, backfill with sewage, stop running water, spray everywhere, and more. We will help you figure out what has gone wrong with your tub or shower and fix the issue fast. Our bathroom plumbing services are comprehensive, so we will handle whatever your bathroom can dish out. Our expert plumbers promise to get to you fast, assess your bathroom, then come up with a plan to get things back to normal. 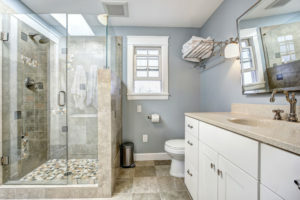 Don’t waste another day stressing about your bathroom plumbing in Fairport, NY. Just get on our schedule and let one of our plumbers handle that stress instead! You won’t be sorry and you’ll be able to get back to your normal life fast!